Twenty-five years ago Raymond Moody’s Life After Life created a worldwide change in our understanding of death. Dr. Moody’s research has rippled throughout the world and has helped in no small part to form our modern expectations of what we will experience after death – the tunnel of white light, the presence of long-dead loved ones waiting for us on the “other side.” Keep in mind that twenty-five years ago this was not common imagery to associate with the experience of dying. Dr. Moody inspired the first generation of researchers dedicated to a scientific understanding of human consciousness and death, researchers who have in turn created a new science of near-death studies. Bruce Greyson, professor of psychiatry at the University of Virginia, has said that “a whole new world” opened up following the publication of Moody’s research. This change in our collective worldview has been so profound that it is hard to remember the cultural conditions that existed before 1975, when the book was first published. Prior to the publication of Life After Life, the term near-death experience did not even exist. Physicians called it the Lazarus Syndrome, “implying that it was the result of medical pathology. Patients didn’t call near-death experiences anything, often thinking that they were mentally ill or had had hallucinations from drugs or a lack of oxygen to the brain. Once Dr. Moody took the time to actually listen to people who had survived heart attacks and so learned about their near-death experiences, our society had a sort of collective “aha” and began to realize that something very spiritual happens to us when we die. Although George Gallup as estimated that five percent of the general population has had a n ear-death experience, people were afraid to talk about them for fear of being ridiculed. Far too often they themselves doubted the validity of what had happened to them. Life After Life was hugely successful because it addressed two major problems in twentieth-century Western Civilization: (1) the loss of collective societal myths having to do with death and dying, and (2) the systematic devaluation of anything to do with the spiritual side of the humans. Dr. Moody’s work reminded us that we are at our very core spiritual beings, and the fact that a loving light greets us when we die is proof of that. When we die, our own lives are evaluated and interpreted not according to how much money we made or our status and prestige but according to the love we shared with others throughout our life. At a time when church attendance and participation in the traditional organized religions was reaching an all-time low, Life After Life rekindled an understanding of the importance of spirituality in our daily lives. It is fitting that Life After Life was originally introduced by Elisabeth Kubler-Ross, the pioneering researcher on death and dying. Although for tens of thousands of years humans accepted death as a natural part of life, a brutal revolution in our attitudes concerning death occurred at the turn of the last century. Death became unnatural, dirty, medicalized, and hidden from the public view. Whereas most people died at home in the 1800s, by the mid-twentieth century most people died in hospitals. The aggressive end-of-life interventions medical science made possible resulted in the dying person giving up dignity and control over his or her life. By the latter part of the 1900s, even the American Medical Association concluded that dying patients were subjected to humiliating and unnecessary medical interventions that robbed the dying process of any dignity. In 1965, when Elisabeth Kubler-Ross wrote her book On Death and Dying, death was something that was not discussed. Dying patients were subjected to the “loving lie.” They were not told the truth about their medical situation, as others felt that the truth was too traumatic and would rob them of hope. Social scientists have, of course, documented that dying patients always knew they were going to die anyway. The loving lie only served to insulate the medical profession and society from the facts of death. Dr. Kubler-Ross dared to actually talk to dying patients about their feelings. This generates enormous hostility from the medical staff at her hospital in Chicago. For example, one nurse angrily asked her if she enjoyed telling patients they only had a few weeks to live and were suffering from the loneliness and isolation that our societal fear of death caused them. Although Dr. Kubler-Ross has gone on to make her own contributions to the spiritual understanding of what happens when we die, in her first book she discussed only the emotional stages of death. These included denial, isolation, anger, bargaining, depression, and acceptance. Our society was astonished to learn even these commonsense observations. Establishing that dying people had any feelings at all seemed to anger and outrage a healthcare establishment dedicated to saving lives, not facilitating death. In the mid-sixties, although there was a sexual and political revolution in the United States, death as a topic was not discussed, and dying visions and deathbed spirituality as topics were forbidden. It took another decade before the climate was ready for Life After Life. Dr. Kubler-Ross had introduced the “shocking” concept that dying people had predictable feelings about death and often even accepted it. Ten years later, Dr. Moody explained why. Instead of death simply being the extinction of life, he documented that it is a spiritually dynamic time with life-transforming insights. These same insights have transformed our society as well. It is ironic that the same medical technology that contributed to the degrading and humiliating conditions of dying patients allowed us to successfully resuscitate people so that they could report their near-death experiences. By the early 1970s medical technology had advanced to the point where successful resuscitation from cardiac arrest was commonplace. Although there have always been stories describing a life after death, prior to the modern era it was rare to survive clinical death. Modern intensive-care medicine and rapid-response medic teams have made the cheating of death routine. Dr. Moody was the first to recognize that these same patients could contribute to our understanding of the last few minutes of life. A thousand years ago a book such as Life After Life would not have been needed, as everyone was familiar with the spiritual aspects of dying. In 1975 it was not enough to document that they dying have visions of another life; it was also necessary to prove that these visions were real and not simply hallucinations of the dying mind. Twenty-five years later, virtually every conscious researcher and medical scientist in this field agrees that these experiences are a real and natural part of the dying process. The first generation of near-death researchers documented that the experiences are real, not the result of hallucinations or brain pathology. Their work led in turn to a second generation of scientists such as myself. We did a controlled clinical study of near-death experiences in children at Seattle Children’s Hospital and again documented that these experiences are a real part of the dying process and not caused by drugs or a lack of oxygen to the brain. These children, too young to fear death or to know what a near-death experience is, told the same stories as the adults tell in Life After Life. Today, no one has to feel ridiculed or mentally ill simply because they have been fortunate enough to have a near-death experience. Life After Life documented that near-death experiences can positively transform those who have had them. The inner anger and type A personalities that lea to heart attacks in the first place seem to melt away from exposure to the spiritual light they see at death. The International Association of Near-Death Studies (IANDS), an organization dedicated to counseling and support for persons who have had the experience, took these experiences and that message, and built an international organization that has contributed to the transformation of our society. IANDS actively contributes to and encourages further scientific research. It was Dr. Moody’s book that directly resulted in the formation of this organization. Sign up to receive messages in your inbox! 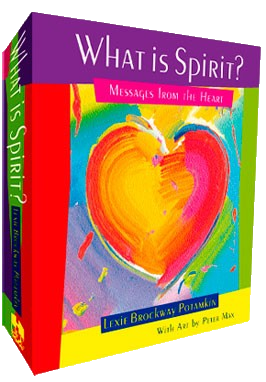 Plus - Get a free preview of Lexie Potamkin's inspirational book What Is Spirit? Messages From the Heart. Join our mailing list to receive a free excerpt & the latest news and updates from Lexie and the Spirit Peace & Love team. Thanks, now check your inbox for your free copy. What is Spirit? Spirit is something we all have in common, and yet we each have our unique experience and point of view. Find out what celebrities, business people and others have to say about what Spirit means to them.